Just as the bodies of people do, the bodies of horses may react in a negative way to excessively hot or humid weather. Heat stroke and exhaustion may occur in very hot months, as well as sunburn, which can be a very painful ordeal for a horse. When going through a great deal of physical exertion, the body of a horse may be unable to properly regulate the temperature of the body. When too many vital electrolytes are released through sweat, not to mention the all important fluids in a horses body, heat exhaustion can occur and this is pretty dangerous. Keep in mind that if your horse is not a working horse or a race horse, it can still suffer from these problems if it is kept confined to a stall or a trailer or another enclosure. Humidity can increase the likelihood of heat exhaustion as well. Signs that your horse is suffering from heat stress are lack of a desire to play or eat, or come when called. Unnatural behaviors like this are great indicators, as is lethargy in general. Heart rates may go up and the horse may appear to pant. If the temperature (taken rectally) is higher than 105 degrees, you may want to consult a veterinarian. When electrolytes are lost through sweat, important vitamins and minerals are lost as well. This can lead to bad blood circulation and even blood thickening, which is never a good thing. Temperature and humidity combine to create painful tissue injuries and other areas are affected as well. This can lead to ataxia, which has to do with the horse’s lack of ability to control the movements of their muscles. If you suspect that your horse may not be getting enough water in the hot months, do the pinch test. Pinch a fold of skin and observe whether or not the skin remains pulled up. Also, another great way of testing that is to put some pressure against your horses’ gums. When you let go, there should be a white spot that is slowly filled in with the normal pink color. If not, consider the fact that your horse may not have enough fluids and take corrective actions. Even if the body temperature of your horse has gone up, they may not sweat enough to actually cool the body to an adequate temperature. If you want to lower the body temperature of your horse, move them into an area where air flow moves about and rinse it down with cold water. This can be done using a nozzle, towel, or sponge. Rubbing alcohol causes evaporation and is also helpful in lowering the temperature of your horse’s body and can reduce the chances of heat stroke. Occasionally, a v et may decide that a horse is so dehydrated that further action must be taken, and in such cases they may apply an IV. Just as with people, when horses are under the sun for extended periods of time, they run the risk of a sunburn. Swollen areas, cracks, skin flaking and scabs are all signs of sunburn in horses. Sunburn occurs on skin that has been ‘photosensitized’ so of course all pink skin on the horse is at risk. This has to do with skin and a reaction to the light coming from the sun. Certain plants and chemicals that may be found in what horses ingest could cause desensitization and other problems, including liver issues. Such a case can lead to increased risk of sunburn. 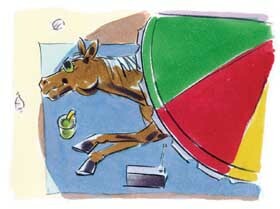 Read the next horse health tips article on Helping a Horse Gain Weight.